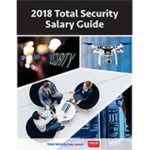 The 2018 Total Security Salary Guide is here to help physical and technical security employers and employees understand where they stand in today’s security job market. News, Tips, & Best Practices: Keep on top of the latest news and trends in security. Webcasts: Join us for a free live or on-demand event. Get your questions answered by expert speakers. Surveys & Research: See how your peers are solving tough workplace issues and planning for the future. Add to the conversation and share your solutions. Expert Insight: Read articles from industry-leading editors on the past, present, and future of security. Week in Review: Get a weekly recap of the most popular security news and free resources.